Almost everyone loves authentic Mexican cuisines, mainly because of their spicy and mouth watering dishes. If you enjoy eating foods such as red rice, taco de lengua, and arroz con leche – you will definitely enjoy other varieties of foods they have. Most of their food is made from corn, vegetables, and meats. If you are a vegetarian, why not try the “veggie burrito”? Most of the time it includes beans, green salsa, rice, lettuce, tomatoes and sour cream. You can even add extra queso or otherwise known as “cheese” in your burrito. Have you ever tried a dish called Pico De Gallo? This dish is mildly spicy, with diced tomatoes, avocados, and other ingredients. Most vegetarians love to eat this with salted chips made from corn. If you love drinking something with your meal, you should try some of their signature drinks. Agua de Fresca is a fresh drink which includes watermelon juice, ice, and other fruit juices. The blend is absolutely delicious and if you enjoy fruit drinks – you will definitely like this one. This summer drink is not only healthy, but also is sugar free. 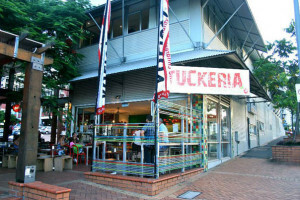 Let’s take a look at one popular Mexican restaurant in Brisbane. Have you ever heard of Silla Maria? This is a Mexican & Latin American restaurant which serves many dishes. They are open Tuesday through Saturday from 5pm until late. If you plan on booking 5 people or more, you’ll most likely need a reservation. Besides, on some of the days they are packed. This doesn’t surprise us since they have such delicious and affordable food to taste. The best part of all is that they can cater if you have a special event going on. This exotic restaurant has gluten free dishes, non-spicy and even vegetarian. They actually have a key on the menu to let you know before you try. They have nachos, Salvadorian pupusas, fried bananas, and even tamales. With all the varieties to choose from, you simply can’t go wrong with this restaurant! Another restaurant that you can visit is a favorite of ours and it’s called “The Burrito Bar”. Although they have not been in business for too long, their burritos are amazing! They serve three different $5 lunch burritos that you can enjoy. There is one dish called “Elote” which is char grilled corn with spicy chipotle mayonnaise. It also has some fresh lime to add an exotic flavor. The chips there are wonderful since they have so many sauces to go with it. There is Pico de Gallo, green salsa, chipotle sauce, and even a cream avocado sauce. Torta Chorizo is one of their specialty foods and has plenty of meat. It’s almost like a Mexican burger that has beans, avocados, and salsa in it. We guarantee that you will love this restaurant and might even come back for more! What nightlife is avaliable in Brisbane? Travel to all the Nightlife in Brisbane with our car rental Brisbane service. Drive to a range of Brisbane Pubs with our Brisbane car hire service. Journey to Bribie Island with our Brisbane car rental service. Travel to The Australian Woolshed with our Brisbane car rental service. The Australian Woolshed is an authentic, multi-award winning Australian attraction based on a typical outback sheep station, located in Brisbane. Confused where to dine out in Brisbane? Look where to Dine Out in Brisbane with our cheap car rentals Brisbane service. What’s on the Menu in Brisbane? Find out what is on the Menu in Brisbane. Dining out in Brisbane? Consider yourself well-fed, with our top three restaurant picks.